The only thing that can help us is self-annulment before the group, the teacher, and the Creator. This involves connecting to the environment and absorbing from it as much as humanly possible. History presents us with many such examples. For instance, one of them is Joshua Bin Nun who merited becoming Moses’ successor. It is our internal force that leads a person to the final stage of correction, by lovingly bringing him or her closer to the final correction (Gmar Tikkun), after the force of Moses has done its part. In other words, he cleaved to his teacher’s actions and wanted to be his inseparable part, thereby receiving Moses’ wisdom. It was he who merited and not the students who were studying. He didn’t even study, but rather received spirituality “Peh El Peh” (“from mouth to mouth,” through the common screen), by having adhered to his teacher. And those who did study also received it, each at their own degree (they were great Kabbalists as well), but not as exalted as that of Joshua Bin Nun. Were they not aware of such principle? They were, but could not apply it. It all depended on how strongly a person is trying to annul himself before the teacher and the group. I would also add that “good fortune” plays a part in this too. That is, additional settings provided a helping hand which we are not aware of that descend from Above, “dripping” downward (“luck” or “Mazal,” from the Hebrew word “Nozel” or “a trickle, drip”). It is strongly determined by the root of the soul from its predestination. But there is no point in discussing what is not up to us. We have to do what is up to us, which is self-annulment. It is described everywhere and isn’t news to anyone. What do we do if we are not succeeding? I know from my own experience how hard it is to achieve. Usually, a person stumbles over the simplest obstacles: They seem so easy to overcome, and yet he can’t. He even understands that it is beneficial in every respect, even the corporeal one, but something inside him prevents him from doing so. We are experiencing a very unusual period in human history. Beginning now and onward, all generations will live guided by the attempt to go from perceiving reality within to perceiving reality outside of us. This is why we feel such a great emptiness inside us, in our family lives, in our relationships with children and others, in everything that we do. This is not only observed in separate individual countries, but throughout the entire world as well. The changes happening in the ecology and climate of the planet become a bigger threat with every year. But all of this happens in order to change the perception of reality within us, which evokes a very unpleasant sensation, to the ability to go out of our egoistic world and discover that we have now gone from perceiving evil to perceiving goodness. And if we were to come to the desire to bestow, then, naturally, we would be happy because we would not be destroying ourselves in a global world where we are all integrally connected. On the contrary, we would succeed in furthering our advancement because it is the only possible way to live and exist instead of destroying one another. But until we change our attitude towards us, other people, the world, and general reality, nature will not stop pressuring us because we have already crossed the designated line. Essentially, what does Kabbalah say about this? It says that if we want to continue to develop without suffering, we should come into agreement with the higher state of nature (we do not have a choice) and understand that our current state is very bad. This perspective gives us an opportunity to develop beautifully, and rewards us with an existence in an eternal and perfect world which becomes revealed here, through the changes in our perception. For this reason, in everything that happens to us, we must see it as a great help from Above, from the entirety of common nature, which helps and directs us this way towards the proper advancement, even though sometimes it manifests through unpleasant influences. But if we are sensitive to all the little signs of this sort, like a smart, obedient child who understands how to find a common language with the grownups, we will advance well. We really have a wonderful adventure ahead of us instead of a hard life. From the Introductory Lecture Series 12/28/2010 "Opportunities for Development"
The evil that we need to realize within is not the same egoism that accompanies a person in his daily life. The real evil only becomes revealed in relation to the friends in the group. When you try to connect with them, you reveal how hateful and repulsive this idea is to you. Evil is when you are indifferent to unity, when you constantly forget about it. Consider this evil! This is because you evaluate your evil egoistically; you judge it according to your full stomach or pocket, even though this is not evil but simply an animal body. Evil only becomes revealed against connection, which is where the breaking occurred. The realization of evil in the “preparation period” begins with the moment that you begin to treat the group as the place that has the border (screen) before the spiritual world. The first contact with others is the crossing of the Machsom, the bridge that opens up from you towards the others. When you connect with the others into one whole in the very first property, the smallest Reshimo (the spiritual gene), this then becomes revealed as the crossing into the spiritual world. Evil exists only here in the connection with your neighbor; everything else is not evil but just “weaknesses” of the animal body. One needs to completely transfer his attention from a polite treatment and an “intelligent attitude” towards the actual evil, where the breaking took place. Otherwise, you will think that a wolf and a lion are evil and birds are good. We are used to looking at creation in this twisted way, and it prevents us from seeing the truth. As soon as you transfer your attention to your connection with your neighbor, you localize the spiritual area which only lays in the connection with your neighbor, and then the Creator becomes revealed between you. 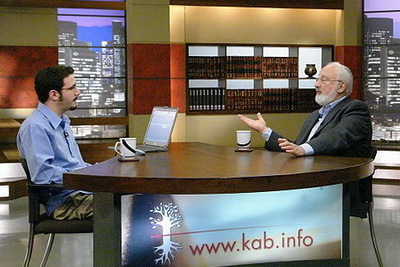 From the 4th part of the Daily Kabbalah Lesson 1/2/2011, "The Wisdom of Kabbalah and Philosophy"
To send a question for the program, please click here.